What is that man banging on about again? 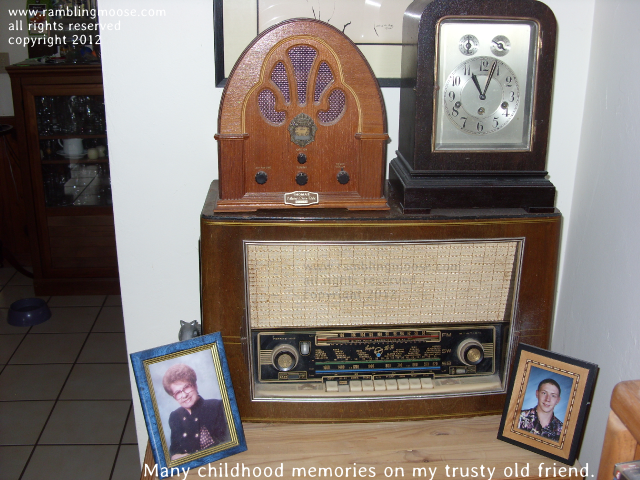 Growing up, I discovered Dad's Radio. I have it here. It still works. It is a grand thing, a Blaupunkt Hi Fi, built in October 1956. Glowy things in the back called "Tubes" or "Valves". It would get warm and make music and entertain you in a way that the connected era doesn't. Back when you had four TV channels, AM and a growing thing called FM that weirdos and Dentist's Offices listened to, you would eventually get bored with what was on and do something today that may be radical - turn off the TV. Or the radio, depends on what you are "consuming". Although being a precocious two year old (yes, I was 2 1/2 at the time) I discovered Dad's Radio. He showed me how to use it, although I would bet it was after my banging on the buttons that made things work and probably after some yelling on his part. I got to listen to the usual stuff but being that kid I wanted more. I found a world of more on Shortwave. At that time in my life I enjoyed being told stories and other than PBS, you didn't have real story tellers. Of course you had cartoons but they got repetitive and daytime TV back then was soap operas. Talk about dull. Living on the prairie of South Jersey, we were close enough to be able to pick up certain international broadcasts. There was a relay on Shortwave out of Sackville New Brunswick Canada that broadcasted the CBC, BBC, Radio Australia, and a few others. I was hooked. Learned some French by listening to CBC when they shifted at the hour from English to French on the Northern Quebec Service. Other times, there was the BBC World Service. The World Service was a life long love affair that continues to this day. I couldn't explain to the neighbor kids what I was listening to, and they weren't interested being more inclined to listen to local radio out of Philadelphia and the same thing that all the rest of the kids were listening to. While they were listening to pop music on AM radio, I was being told stories and game shows. I also didn't care for Pop Music at the time having been exposed to Classical on Shortwave. I had a bizarre knowledge of what was going on in The Empire at the time and listened in as colony after colony gained independence from The Queen. All of this happened in a building called Bush House. They moved the World Service there after the bombing in 1941 during the Blitz in the Second World War, and remained there to this day. Today actually. They will be moving the World Service to The Strand in Central London. The final news bulletin was read at Noon in London, 7AM our time in Florida. Of course the news will go on, the World Service broadcasts mainly News and Business News since the "light entertainment" was shifted over to BBC Radio 4 in the 1980s. I tend to only check into the World Service for news broadcasts preferring the Radio 4 Programming since it is broader and they're still doing those "stories" I grew up with. I'm sure my sister could tell you stories about her weird brother listening to that big box in the rec room in Cherry Hill, NJ. It's just the boxes got smaller and now connected to the internet so you too can pick that out as well as the overwhelming chatter of billions of voices. In the middle of all of that, the comforting voice of Auntie saying "This is the World Service of the BBC" is still connected via a link on my smartphone and on my PCs. It's one of the links with the past that I've managed to maintain all these years. It's just moved on to new digs, just like the production studios.